A new computer simulation from NASA’s New Horizons mission offers a look at the latest objects discovered in the distant Kuiper Belt – from the vantage point of the Pluto-bound spacecraft itself. Created by Alex Parker, a New Horizons outer solar system science fellow from the Harvard-Smithsonian Center for Astrophysics in Cambridge, Mass., the simulation takes “passengers” by dozens of newly discovered Kuiper Belt objects (KBOs) near New Horizons’ trajectory to Pluto and beyond. 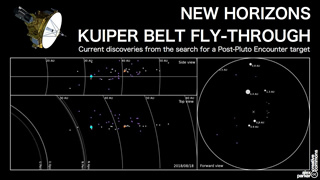 The objects were found by the New Horizons survey team as well as by members of the public – using the Ice Hunters program – during the ongoing search for a KBO that New Horizons might approach after it flies past Pluto and its moons in July 2015. “Alex’s simulation, based on actual KBOs the New Horizons search team is finding, really brings home what flying through the Kuiper Belt will be like, with many distant and hopefully one or two close- encounters with ancient Kuiper Belt objects in the years after the Pluto system flyby,” says New Horizons Principal Investigator Alan Stern, from Southwest Research Institute in Boulder, Colo.
Scientists are using some of Earth's largest telescopes to search the swath of sky where such an encounter target would be today. It’s a difficult search, essentially a hunt for very faint objects slowly moving against regions of the sky thick with stars. However, search team lead John Spencer, a New Horizons co-investigator from Southwest Research Institute, says the team has developed advanced digital-image processing algorithms for sifting through the data, and has used these tools to discover several KBOs that will fly near the spacecraft – though the objects are not close enough for New Horizons to reach within its projected fuel budget. 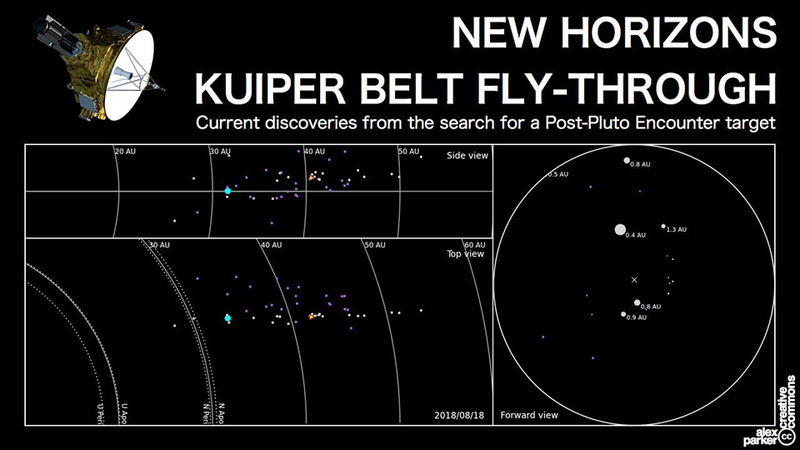 Go inside the search for potential New Horizons flyby targets in the Kuiper Belt!